“Karl Pierre Daubigny was Charles François Daubigny’s son and much influenced by him. He made his debut at the 1863 Salon with A Track (Un Sentier) and Île de Vaux in Auvers (L'Île de Vaux à Auvers), which showed his keen feel for nature in spring. He continued to exhibit regularly at the Salon. In 1866 he showed View Taken in Picardy (Vue prise en Picardie) and Halt of Bohemians(Halte de Bohémiens). He was awarded medals in 1868 and 1874. Karl Pierre Daubigny figured in the exhibition From Delacroix to Dufy: Cliffs and Rocks (De Delacroix à Dufy, Falaises et Rochers) at the Musée des Terre-Neuvas in Fécamp in 1998. In 2000 an exhibition featuring the works of both father and son for the first time was organised at the Musée Daubigny in Auvers-sur-Oise” (Benezit, Dictionary of Artists, Gründ, 2006). 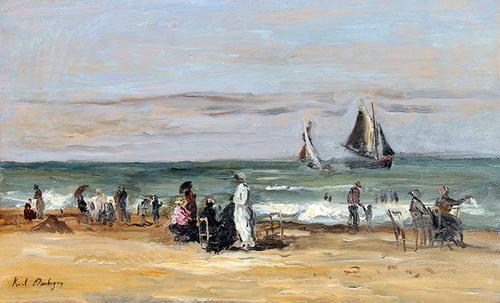 Please contact us if you are interested in selling your Karl Pierre Daubigny paintings or other artwork from the 19th century and early 20th century.